Arrive at New Delhi and get a ride to Haridwar. On the way get all requisite biometrics done. On arrival at the holy city Haridwar, check in to your hotel. In the evening, proceed to Har Ki Pauri on the banks of River Ganga. Get blessed by the beautiful sight of Ganga Aarti at dusk. Dinner and Overnight stay at Haridwar. After early morning breakfast check out from the hotel and drive for Guptkashi. On arrival check in at hotel/ camps. Rest of the day is free to explore the Guptkashi town. The religious town has temples and holy sites. Visit the Vishwanath and Ardhanareshwar temple. Dinner and Overnight stay in Guptkashi hotel/Camps. Early morning after breakfast check out from the hotel and drive to Sonprayag. Sonprayag is the start of your 20 km trek to Kedarnath. You can hire a Doli or a horse, for your trek at your own cost. The chants of Jai Bholenath reverberates in the mountains. Pilgrims chant the holy name as they walk through the difficult terrain. Mists blanket the mountains and when they clear out you can see the beauty. While trekking to the mountain shrine, come across Mandakini, one of the main tributaries of the Ganges originating at Kedarnath and flowing through Gaurikund. On arrival check in at Govt. Camps/Lodges. Dinner and Overnight rest. Get up before dawn. Take bath and reach the temple by 4:45 am. Attend the 'Abhishek’ to Kedarnath Shiva. Pilgrims are taken inside Garbha Griha to touch the idol. Take blessings of as you prostrate with your head touching the deity etc. After darshan and puja you come out of the temple and return to the Govt. Camps / Lodges. Later start the return trek of 20 km from Kedarnath to Sonprayag. The vehicles wait for you in Sonprayag Car Parking to drive to your hotel. Dinner and Overnight at Guptkashi. This morning, after an early morning breakfast check out of the hotel at 08:00 am. Proceed to Badrinath via Joshimath. The drive to arrive at Badrinath is through some wonderful mountain roads. On arrival check into the hotel. Get rest and after refreshments, you are all set to go to Badrinath Temple for darshan in the evening. Before you go to the temple, go to Tapt Kund (Hot Spring). Take bath for purification and then go to the temple. 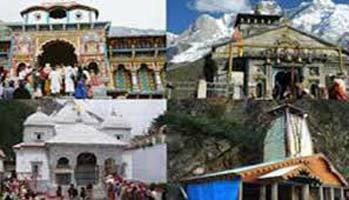 Shri Badrinath is a holy site, dedicated to Lord Vishnu. The temple is of a conical shaped temple with a gold-plated bull and spire is 15 meters in height. After Darshan, get back to hotel. Dinner and overnight stay here. Start early morning to go for Badrinath darshan. Return back to hotel for breakfast at hotel. Proceed for Badrinath local sightseeing. Today visit the Mana Village, Vyas Gufa, Ganesh Gufa, and Mata Murti temple. Post lunch, in afternoon driver back to Rudraprayag via Karanprayag. The small religious town of Rudraprayag is located on the holy confluence of river Alaknanda and Mandakini. On arrival check in at hotel. 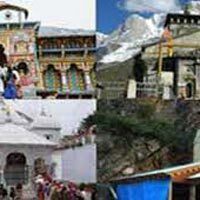 Explore the Rudraprayag town and visit the holy Koteshwar temple. Return to hotel for dinner and overnight stay. Early morning, after breakfast, start for Rishikesh. The spiritual city on the banks of River Ganga is known as the Yoga Capital of the World. On reaching go for sightseeing. Visit Ram Jhula and Laxman Jhula. Evening drive to Haridwar. On arrival, check-in at hotel. Dinner and Overnight stay here. Start the morning with a healthy breakfast. Check out of your hotel and drive back to Delhi. On reaching Delhi transfer to Railway Station / Airport.